Happy Monday! I am kicking off the first week of summer break by celebrating The Almost Fearless Hamilton Squidlegger with Timothy Basil Ering. He answered five questions and finished two sentence starters. Thank you, Timothy! Timothy, congratulations on the publication of The Almost Fearless Hamilton Squidlegger! I know many young readers will relate to Hamilton’s fears and his fantastic imagination. Timothy Basil Ering: Thank you! I’m very excited about the recent release of The Almost Fearless HamiltonSquidlegger. I hope the story will inspire children to use their imagination in a positive way to transform the scary monsters in their thoughts into lovable friends! Yes, I agree, I think many young readers will relate to Hamilton’s fears and imagination. I remember the times I had scary thoughts when I was a young boy in my bed, in the dark. I remember the adrenalin pumping as I scurried out of my bed and down the hall to seek safety in my Mom and Dad’s bed. Sometimes, if my parents were asleep and I didn’t want to wake them, I would quietly place my pillow and blanket on the floor next to their bed, which would give me enough security to be able to sleep. I guess I thought that no monster would ever try to “get me” with the presence of my parents so close. But alas, though my parents would protect me from any evil and scary thing, they would for some reason, be more apt to move me back to my own bed. It was around that time in my life that somehow on my own, I developed a trick that enabled me to deal with scary thoughts and dreams when they happened so that I could feel comfortable enough to stay in my own bed. The trick was that no matter how scared I was I would show the monsters that I was a cool, kind, and brave person. The goal was to gain respect from the monsters. The Almost Fearless Hamilton Squidlegger is filled with inventive words like frackensnapper, scrintalberry, and bracklesneed. What are some of your favorite words? Timothy: I don’t think a day goes by that I don’t have fun pronouncing and inventing nonsense words. It’s fun to me using nonsense words like scrint, scrintly, or scrintal as adjectives, or nouns, or verbs, etc. Adding a word we all know like “berry” to a nonsense word like “scrintal” to make “scrintalberry” is music to my ears! A few real words I love are, squid, flick, crinkle, crimp, cringe, skitter, gunkhole, and holus-bolus. Are there any words you wish were used more often? Timothy: No, just when needed to keep them special. Oh, and would you eat a double-decker grasshopper worm cake, with snake-belly frosting? Timothy: Yes, I would enjoy trying a piece of grasshopper worm cake with snake belly frosting. I would probably find that I liked it. Hamilton’s Dad loves cooking and loves to make others happy with yummy food. So, I’d trust his cooking and his creativity with flavors. That cake would be worth a big bite. It might remind me of an absolutely delicious breakfast I ate while visiting the Pacific Northwest which was octopus hash with poached eggs on toast- I loved the sound of it just as much as the taste! Take us back to when you were writing and illustrating The Almost Fearless Hamilton Squidlegger. What would I have seen in your studio if I had been a fly on the wall? Timothy: If you were a fly on the wall of my studio you would have seen me staring right back at you. There is lots of quiet staring and thinking going on when creating. There’s many places in my studio a fly might want to sit other than on the wall… maybe on the barracuda skull, the monkey skull necklace I bought in Burma, my conch shell I dove for in the Bahamas that I made into a horn, the fish jaws, the wild boar tusk, the lobster claws, or the horse shoe crab. You might see me tinker with my fishing tackle to try to coax the creativity out- tying flies, leaders, rigs, sharpening hooks and my fish spear. It all helps to get my mind started, and without warning I’ll drop all that, and pick up my charcoal sticks or stuff a brush into paint and start making art. Then, you would have seen me painting and drawing really fast with loud music playing during these very welcomed sudden bursts of creativity. 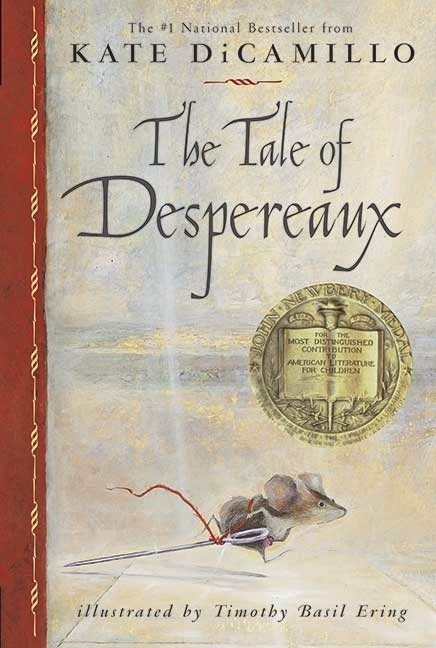 More than a decade ago, you received the manuscript for Kate DiCamillo’s The Tale of Despereaux. Do you remember how you felt after reading it for the first time? Could you visualize Despereaux and his world right away? Timothy: Pure excitement is what I felt after reading Despereaux the first time! And the reason for that excitement was that I had images in my head immediately! When that happens, I can’t sit still and I feel compelled to draw-, which is exactly what I did. I never went to sleep the first night I got into it. I watched the sun go down, and watched the sun come up. In fact, even when the project was first verbally introduced and described to me over the phone, I liked the idea so much I was drawing rats and mice and characters while on that phone call! Picture books are wonders. The stories enclosed in a picture book transcend the mystery of the cover in which the story is sandwiched between. Picture books are not intimidating and therefore amazing opportunities for children to learn to read at a young age. The fantastic bonus of beautiful art in the form of paintings, drawings and mixed mediums in diverse styles and techniques illuminate pages with the magic of illustration to tell even more of the story than the words, opening up minds to let imaginations run wild. Mr. Schu, you should have asked me… Timothy, what is one thing that always makes children laugh? My answer is… describing gross, disgusting silly things! Years ago, I went into the pre-school that my wife taught at to read to the children and help out by warming up their lunch. They crowded around me begging to know what it was that I was stirring in the pot. As I stirred the pasta, I told them it was boiled beetles, and fried snake bellies, and mud covered steamed socks. They were laughing so loud that teachers poked their heads out from other rooms to see what was going on! I get laughs and fun reactions from children every time I read my books to them. Frog Belly Rat Bone’s wet smelly socks and giant picky underpants in The Story of Frog Belly Rat Bone, The hornly scratcher’s boiling pot of eel skins, fish butter, and squid broth in Necks Out For Adventure! , and Hamilton’s favorite double decker grasshopper worm cake with snake belly frosting in The Almost Fearless Hamilton Squidlegger all do the trick! Thank you Mr. Schu! 3 cheers to all of you readers and book people out there for your wonderful support! I am giving away one copy of The Almost Fearless Hamilton Squidlegger. 1. It will run from 6/9 to 11:59 p.m. on 6/11. Borrow The Almost Fearless Hamilton Squidlegger from your school or public library. Whenever possible, please support independent bookshops.